This issue is the second milestone on the way to the 20th AIDP World Congress dedicated to ‘Criminal Justice and Corporate Business’. It brings together the proceedings of the preparatory Colloquium on ‘Individual Liability for Business Involvement in International Crimes’, held at the University of Buenos Aires on March 20th-23rd, 2017. This volume contains the resolutions adopted in Buenos Aires as well as the general report, two special reports, and ten national reports (Argentina, Brazil, Colombia, Croatia, Finland, Germany, Italy, Netherlands, Russia, United States). It offers a broad overview of the debate on and the main challenges raised by corporate involvement in international crimes. 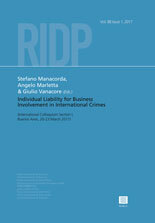 Through the analysis of both national and international case law and legislation, this issue provides insight into a variety of topics related to the liability of corporate officials and sheds light on the different doctrines of co-perpetration and complicity arising at the national and international level (eg: neutral acts, negligent complicity, complicity by omission, command responsibility; white collar crimes doctrine). Special attention is paid to the complex balance to be achieved between an effective prosecution of these conducts and the respect of the general principles of criminal responsibility.